You're busy. You don't have time to spend hours creating Halloween costumes for baby. You need some ideas, fast. Well, I do aim to please. I've got 15 ideas that you can make in 15 minutes or less. Dress your baby all in black and use Halloween makeup to whiten his face, adding black triangles around the eyes, a few fake tear drops and bright red lips. He's a mime! Stick in a festive Halloween pacifier. 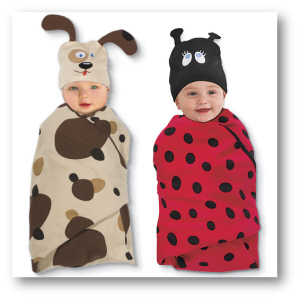 The swaddle costume is ideal for the last-minute dash for Halloween costumes for baby. Wrap up, slap on the hat, and head out the door. Dress her in black leggings and a black sweatshirt, draw whiskers on her face with eyeliner. Fashion little ears out of construction paper and tape them to a headband. She's a black cat! For a vampire, cut out a cape from red or black fabric, glue it on the back of his sweatshirt (not around his neck) and pencil-in fake fangs with an eyeliner. Dress her in a black t-shirt and witch's skirt with orange-and-black stockings. Use poster board to create a black cone hat, decorate with orange glitter glue or stickers. Put a black plush cat in the stroller. Dress him in jeans with a red/black plaid shirt. Using ribbon, create "suspenders". Pencil in a beard with an eye pencil and you've got Paul Bunyan. Too bad you can't spray paint the dog blue...or can you...!?! Dress your baby all in white. Cut out two large circles from felt (same size, same color). Glue the felt to similarly-cut poster board. Poke two holes on the top, thread some ribbon between the two pieces of felt, so your baby can have one in the front and one in the back. Using a fabric marker, write "M & M" on the front and back. Make a burrito. Sew (or iron-on) green "lettuce" felt around the top of a biege blanket and swaddle. 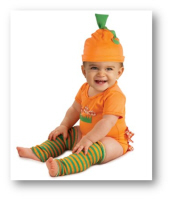 Dress your baby in a simple pumpkin onesie with matching cap and leggings. Mini-Me? Dress your baby in the same color (or shirt) as you, only smaller. Tie-dye a white shirt of your infant's, cut fringes out of the bottom of a pair of brown pants, and create a thick yellow headband out of fabric to transport your infant back to the 1960's. The Farmer in the Dell! Dress him in a shirt and overalls and a straw hat. Fill the stroller with stuffed pigs and cows. Super glue fake flowers all over a green sweatshirt. Dress her in green pants and put a butterfly clip in her hair. She's a garden! ♥ Flitterific Fairy Halloween Costumes for Baby: Which Fits Your Pixie Best? I scraped out of the dark recesses of my right brain. Others I altered from other sources. Time to give credit where credit is due. Here are those other sources.